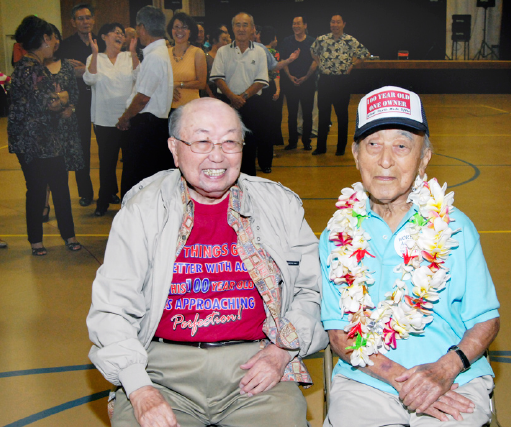 Jimmy Masuda (right, pictured with Frank Shoda) shared his 100th birthday cake with dance classmates at Glenn Yata’s dinner/dance on Oct. 11 at the Nishi Hongwanji Buddhist Temple Auditorium in Los Angeles. He loves dancing and combined it with daily walking and swimming, eating healthily, and even climbing his tree ladder to trim his own trees well into his 90s. He first took dance classes with Harry Kanada, then private lessons with Sherry Novak, competing until his 80s. Masuda still dances jive, waltz, cha cha and other styles at Yata’s group classes and socials, having started about 35 years ago.